My two-month stay in Spain has been an invaluable research experience. The opportunity to spend time in Madrid and Barcelona, to observe and participate in an exhumation, and to interview forensic scientists, photographers, artists, and archivists about the intersection of science, visual representation, and history has allowed me to gain a more nuanced understanding of how memory can be mobilized to discuss the politics of both the past and the present. The information that I have collected over the past eight weeks will be incredibly useful as I begin to define and design my dissertation research project. Even more so, as I begin think about how forensic science and photographic practices are employed differently across different cultural, political, and historical contexts. In this last post, I want to address a few topics that have come up in recent interviews as well as some themes that have appeared and reappeared throughout the course of fieldwork. While in Barcelona, I have interviewed several visual artists and members of the academic community who share an interest in the ways in which visual media has been and can be used to call attention to or discuss the period of political violence that marked a large part of Spain’s recent history. In almost all of these interviews, the “papeles de Salamanca” have played an important – if not a primary – role in describing local and national memory debates. The Salamanca papers are a collection of documents that formerly pertained to the Archivo General de la Guerra Civil Española in Salamanca. The Archive itself consists in an immense stockpile of thousands of documents that were produced and/or collected by the Francoist regime. Now deemed to be an “archivo de la represión,” this particular archive is thought to be an invaluable source of information regarding the inner workings of the Franco dictatorship. In July of 1939, as the Civil War came to a close, a train carrying 12 cars of documents left Barcelona, and in 1940 these documents were expropriated and sent to the Delegación Central de Recuperación de Documentos in Salamanca. The majority of the documents that left Barcelona in 1939 pertained to local Catalan institutions. Throughout the Franco regime, they would be used by the Francoist regime to collect, catalogue, and confirm information about the political opposition. In addition to the insider view that these documents possess, the Salamanca Papers are also an important source of information regarding the ways in which Catalonia experienced the Civil War, the ensuing dictatorship, and eventually the transition. Although the Archive in Salamanca includes collections of documents from Spain’s other autonomous regions, Catalonia has been the only region to demand that these documents be returned to their original home. The history of the Salamanca Papers spans a long, complex period of time. Outlining the this history and the ensuing debates over who should control which documents and where such collections should be physically kept is a task that goes beyond that of a short blog entry. However, that being said, the fact of the matter remains that documents, both textual and visual, possess an incredible political, historical, and patrimonial value for those invested in revisiting Spain’s recent past. 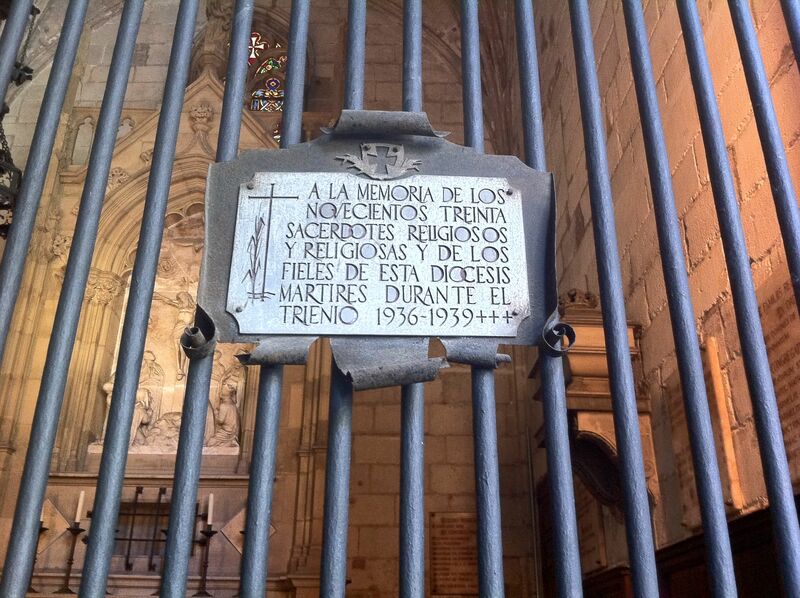 Image of a memorial placard in Catholic Cathedral in Barcelona. The plaque commemorates the Civil War's martyrs - a title which refers to Falangists or members of the Guardia Civil that died during the Civil War. This kind of memorial - like the "Salamanca Papers" - are site of contention for those trying to revisit this period of political violence in Spain's recent past. The memory value of documents – of historical traces that take the form of visual and/or textual inscriptions – is a widely discussed topic both in post-Franco Spain and post-dictatorship Argentina. While my project does not directly address this issue, I think that the debates over who should control these documents and where they should be located are also pertinent to the creation, collection, and categorization of scientific, photographic, and audiovisual forms of documentation that have become a central part of the exhumation process. In thinking about the memory values of documents from the past, one might also consider how new forms of documentation – be the scientific or aesthetic – can become (and in some cases are becoming) sites of political contestation. This entry was posted in Recent Research and tagged Spain. Bookmark the permalink.